It’s not easy to find ripe and delicious figs in Florida. I do have some friends that have had luck and are growing figs in their yard. 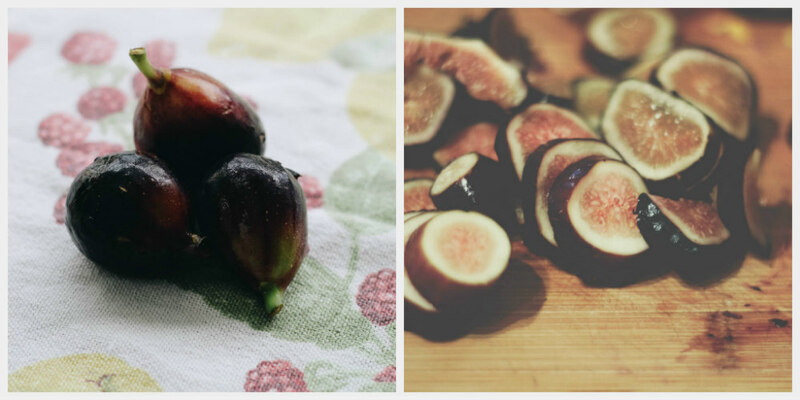 We found some lovely mission figs from California to use for this Risotto with Figs and Prosecco. I still have not come across figs that are as big as the palm of my hand and bursting with sweet juice. That only happens in Italy in the summertime. My mother-in-law has a fruit man that comes by her house and she buys from the back of his truck some of the most amazing fruit. She buys the fruit by the case. Sometimes while we are there, he has cases of figs from Calabria. That’s the day that all the kids are excited and arguing over who had more figs than the other. That is one fruit that they all love equally and passionately. The fruit is so ripe that it’s even hard to remove the peel and it’s one big, sticky fig mess. These mission figs were not the same sort of figs, but at least they were sweet and they were perfect for this risotto. Risotto is a dish that Italians usually make all’occhio (by the eye-eyeing it), sort of like many Italian dishes. I usually measure out two handfuls of the rice per person and make sure to have a about the same amount of broth and extra ready to ladle in while the rice is cooking in a pot next to where the rice is cooking. I think the more you cook these Italian dishes, the more you will get the hang of it and figure out the portions. I usually like to use vegetable broth for my risotto. Unless it is a seafood risotto, then I will use a fish broth (hopefully homemade)and there are some risottos that could use a beef or chicken broth. But when it’s a simple risotto like this, vegetable broth is the way to go. I have come across a recipe here and there that uses just boiling water. If you use just boiling water, you will have a super bland rice dish and that’s not how risotto is made in Italy. I also have had people cook risotto for me with cold broth. I learned to cook it with the broth boiling and that’s how it should be. We have a family member that is dairy free. So part of the risotto was made without butter and the cheese and was vegan. The potatoes had a nice starchiness to the rice and give it a great consistency. I happened to find white sweet potatoes that were delicately sweet. You could also use regular potatoes if you can’t find the white sweet potatoes. For those seeking delicious gluten free ideas, this is one you have to try!! Risotto is not complicated to make and is very versatile, as you can make it with almost anything you like. Leftover risotto can be used to make risotto cakes, arancini di riso, or risotto al salto the next day. Once it has cooled completely to room temperature, transfer the leftover risotto to a container and store covered in the refrigerator. Risotto al salto is basically chilled risotto that has been pressed into a sauté pan with a Tablespoon or two of extra-virgin olive oil underneath to prevent sticking. It is then gently heated to a crisp, and flipped over (there is your salto, the flip, or jump) like a pancake so the other side can get crunchy, too. Some people like it even better this way than freshly made. With me, it’s a tie. Risotto is not that difficult to make, it’s just a little time consuming. You have to be patient and you have to keep stirring. I love how versatile risotto is and that you can make it an almost any way you like. When you use vegetable broth and keep out seafood or any meats and dairy, it’s the perfect vegan meal. With your leftover risotto, you can make risotto al salto the next day. Risotto al salto is just taking the chilled risotto you had in the fridge and adding it into a saute’ pan. Be sure to use a little extra-virgin olive oil in the pan so the rice won’t stick. The risotto heats up and gets slightly brown and crispy and you flip it (saltare-to flip). My kids really love these crispy risotto cakes. Have you ever made risotto before? Have you ever had it in a restaurant? What is your favorite risotto? I think my new favorite risotto is this risotto with figs and Prosecco! 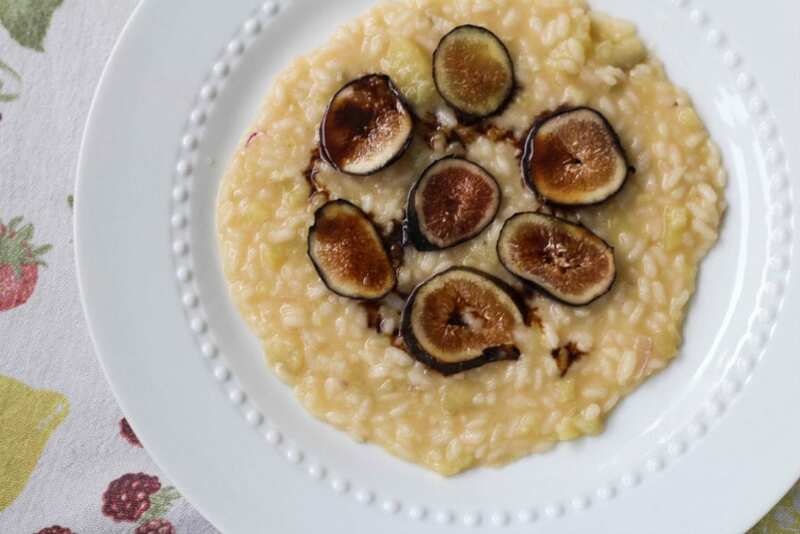 A delicious risotto made with the season's juicy figs. You'll get a sweet surprise in every bite and a touch of Prosecco which makes this the perfect Italian summer meal. In a medium sized pot, add the stock and bring to a boil. Add the sweet potatoes, and boil. Heat the olive oil on medium heat in a large skillet; add the onion and cook until they are translucent and soft (but not browned). Add the rice and stir with a wooden spoon about 3 minutes. Add the Prosecco (or white wine) and cook about 1-2 minutes stirring with the wooden spoon. Add a 4 to 6-ounce ladle of broth and cook, stirring, until it is absorbed. Continue adding the broth a ladle at a time, waiting until the liquid is absorbed before adding more. Remove the sweet potatoes from remaining broth and mash them quickly with a potato masher (mash them enough so that they’re in very small pieces). Add the potatoes and remaining broth. Cook until the rice is tender and creamy and yet still a little al dente, about 15-20 minutes. Remove the pan from the heat. If making this vegan, use margarine and omit the cheese. Stir in the butter and cheese until well mixed. 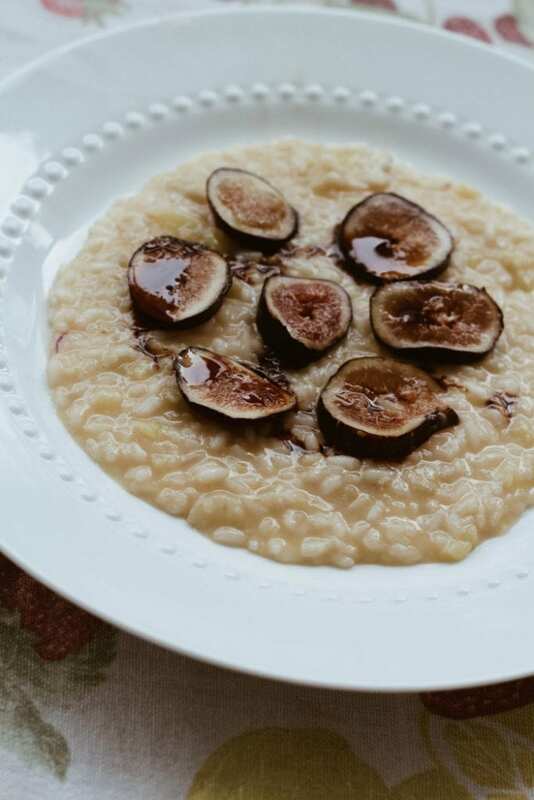 Ladle the risotto on individual plates and decorate with figs and a drizzle of the aged balsamic vinegar; serve immediately. We can't really find big figs around here either. Your mother in laws life sound so wonderful in your posts! I bet living in Italy is amazing! 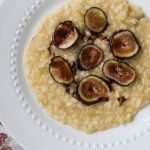 I can't wait to try this Risotto, I'll have to find some figs asap! What a perfect risotto! We have a really hard time finding figs here in Dallas (and desperately miss our fig tree from Louisiana), but man. I'm gonna try to find 'em because I want this risotto! Yum! Best use for figs I've seen ever! Looks so good! This looks so creamy and delicious! I wish I could cook "by the eye" like you but for now, I'll stick to your wonderful recipe. This looks like comfort food to me! You made me so curious! I need to try your recipe! Sounds like a perfect romantic dinner!